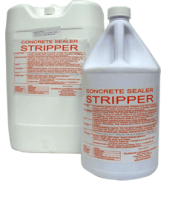 The only stripper on the market that was designed to remove failed Arcylic Concrete and Paver Sealers! Attention: This product cannot be returned! It needs to ship HazMat. Purchaser must sign for package and will not be able to return! Refusal of delivery will incur back and forth shipping charges by purchaser. Works well to remove old stripper and easy to use. Removes old sealer that has turned white. The stripper will remove this but it looks very thick. You may need to strip it a couple of times to remove fully. You will need a pressure washer as well. We do not have test or trial sizes. This should work as long as it acrylic based. i have a solvent base would it work ? If an acrylic solvent, yes. Will this work on cambridge pavers? I have to clean a sealer that is cracking in spots. Will this product remove it? This would depend on what the previous sealer is made of, not the type of pavers that you have. Do you know this? When power washed off, will it kill the grass along the driveway? it is possible that it "browns" out the grass a few inches along the pavers edge. Rinsing thoroughly with water into the grass will minimize this. The Concrete Stripper has to be signed for when it arrives. After it ships, Fedex will send an email with the tracking info. Will this remove Behr Premium Concrete Brick & Paver Wet Look Sealer? It says it's "Clear, non-yellowing, acrylic-based sealer" 100% acrylic latex. It goes on white, and left a milky sheen on our pavers! We tried diluted muriatic acid which didn't touch it. We tried Citrastrip which removed a very thin line , if we used a concentrated tip on a pressure washer. Yes, it will remove it but you will need to pressure wash as well. Apply the stripper in sections of about 100 sq feet at a time, wait 10 minutes and pressure wash off. Repeat until all is removed. We got an electric pressure washer with 2000psi...is that sufficient? Or should we get a gas-powered one with over 3000psi? thanks! You will need one that is 3000 PSI or more. Can this be sprayed on? If so, what type of nozzle should be used? It will need to be rolled on. 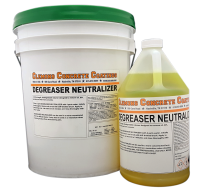 Will the Concrete and Paver Sealer Stripper remove urethane-based sealer? Yes it should. Apply and pressure wash off. 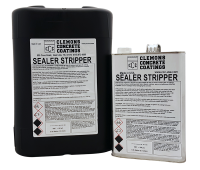 I have ordered the 1 gallon size of the Clemons Concrete Coatings sealer stripper. I need to order the 5 gallon size. Is this the same product? if someone is not home when it comes can we pick it up somewhere? No. Has to be signed for. want to buy your product but someone is often not home and I no it needs to be signed for? Any suggestions? This product has to be signed for as it ships HazMat. Yes you can apply while wet, but the dwell time will take a longer. i have used the sealer stripper on my pavers but there are still some sections that have some sealer that i need to reapply the sealer stripper on. 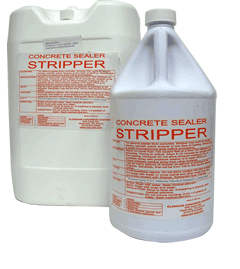 can i use the sealer stripper while pavers are wet? it seems easer because then i can tell which ones still have sealer on them from the water absorption. If acrylic based, then it should. You will need a heavy duty pressure washer as well. Will this product remove Brickform Gemseal 400 clear/wet look?